How is a Challan is generated for making payments without logging onto the GST Portal? 2. 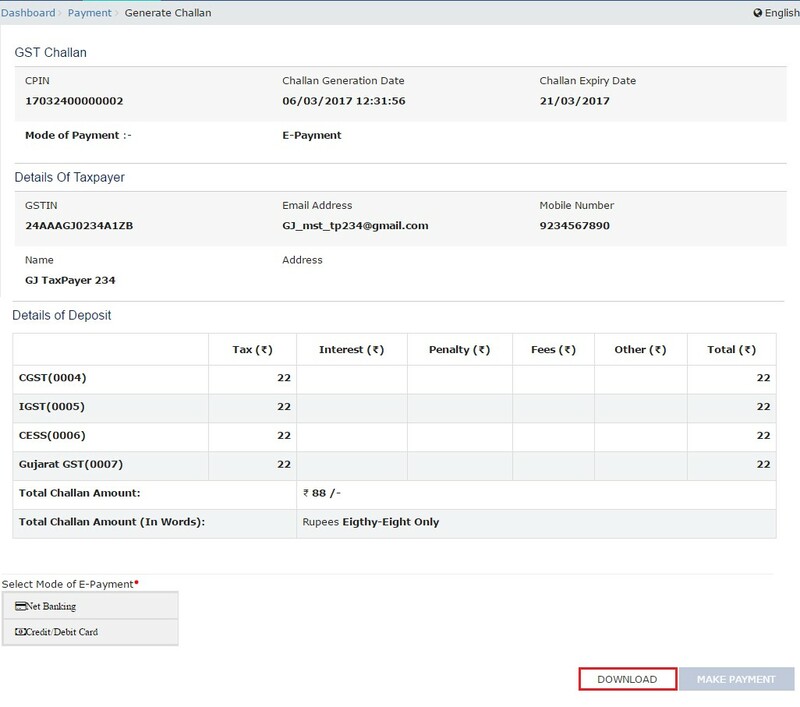 Click the Services > Payments > Create Challan command. 3. The Create Challan page is displayed. In the GSTIN/UIN/TMPID field, enter your GSTIN. In case UN Bodies, Embassies, Government Offices or Other Notified persons wants to create a Challan in pre-login, they need to provide Unique Identification Number (UIN). In case Tax Return Preparers wants to create a Challan in pre-login, they need to provide Tax Return Preparer Identification Number (TRPID). In case unregistered dealer having temporary ID wants to create a Challan in pre-login, they need to provide Temporary Identification Number (TMPID). 4. In the Type the characters as displayed below field, enter the captcha text. 6. In the Tax Liability Details grid, enter the details of payment to be made. The Total Challan Amount field and Total Challan Amount (In Words) fields are auto-populated with total amount of payment to be made. 7. In the Payment Modes option, select the appropriate choice. a. Select the e-Payment as the payment mode. 8. Click the GENERATE CHALLAN button. 9. The OTP Authentication box appears. In the Enter OTP field, enter the OTP sent on registered mobile number of the taxpayer whose GSTIN/UIN/TRPID/TMPID is entered. 11. The Challan is generated. 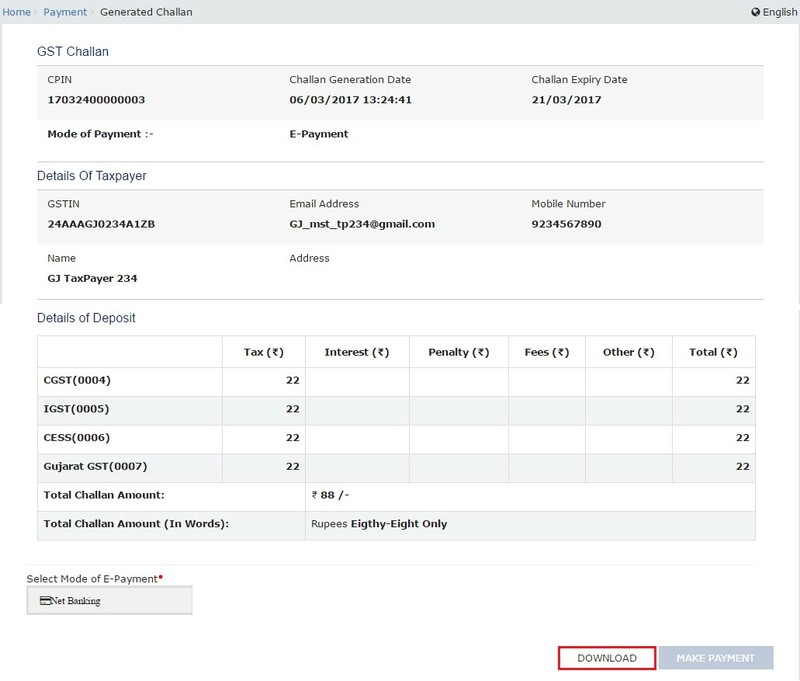 How can I generate a Challan for making payments after logging to the GST Portal? 3. The Dashboard is displayed. 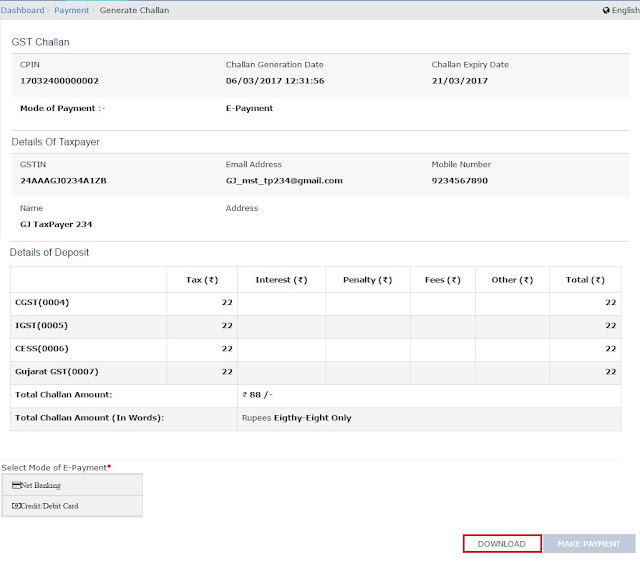 Click the Services > Payments > Create Challan command. 4. The Create Challan page is displayed. 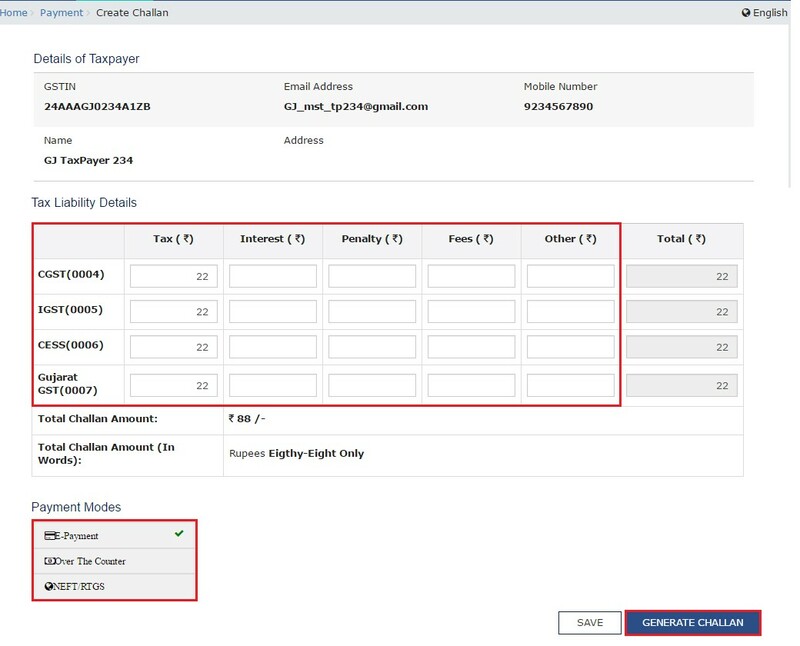 In the Tax Liability Details grid, enter the details of payment to be made. To know the exact tax liability, you can check the Tax Liability Ledger. You can also enter any amount irrespective of your liability which will get updated in your Electronic Cash Ledger which can be utilized later. Amount entered under any Minor head (Tax, Interest, Penalty, Fee and Others) and Major Head (CGST, IGST, SGST/UTGST, Cess) can be utilized only for that liability. Cross-utilization among Major and Minor heads are not possible. 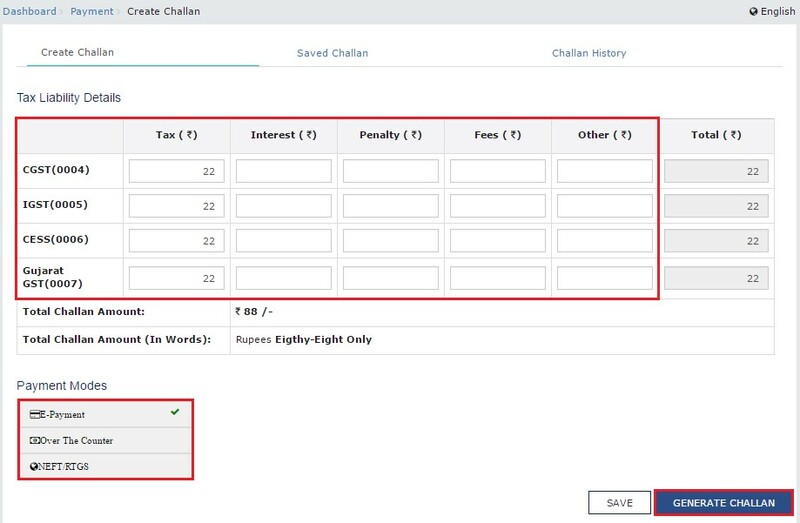 The Total Challan Amount field and Total Challan Amount (In words) fields are auto-populated with total amount of payment to be made. 5. In the Payment Modes option, select the appropriate choice. a. Select the E-Payment as payment mode. You can click the SAVE button to save the challan and retrieve it later for editing. When you click the SAVE button, a unique reference number gets generated to track the saved challans. At any point of time only 10 challans can be saved. 7. To generate the Challan, click the GENERATE CHALLAN button. Once the Challan is generated, you can make the GST Payments using the generated Challan (CPIN). You can also download the GST Challan by clicking the DOWNLOAD button. In case you have saved a Challan, you can retrieve it from Services > Payments > My Saved Challans command. How can I retrieve the saved Challan and edit it? Once a Challan is saved, it is valid for how many days? 3. The Dashboard is displayed. Click the Services > Payments > My Saved Challans command. 4. The Saved Challans are displayed in a chronological order (most recently saved challan is shown first in the list). You can view or edit the saved challans within 7 days of the creation date. After 7 days, it will get purged from GST Portal. You can save maximum 10 challans at any point of time. 5. Under Action column, you can click the Edit button to edit the saved challan.